Welcome back! You can see links to the complete series here, and enter my Lowe's gift card giveaway here. In this series, we're seeing what we can make out of 2x4s. I want to keep it cheap, keep it easy, and keep it totally doable for anyone. Today project is fun and versatile - and we'll be looking at even more design options for it tomorrow. 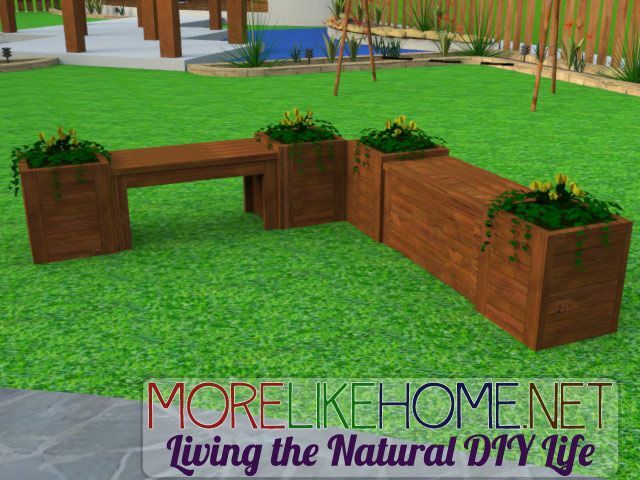 Today we'll be building a bench and planters! Like how I made that all into one step? :) Start by building the front & back of your bench. Use a front board (B) to connect two legs (A). It should be flush with the top of the legs. Attach the front board using your Kreg Jig and pocket screws, or by drilling through the legs into the front board with 4" screws and glue. Repeat to build the back section. Now connect the front and back sections using the side boards (C). Each board should be flush with the top and outside edges of the front and back sections. Attach the side boards using a Kreg Jig, or by drilling through the front (and back) of the legs and into the sides with 2 1/2" screws and glue. Now you can attach the seat boards (D). These boards sit side-by-side across the top of the bench and should be flush around all sides. Attach them by drilling down through the seat boards into the sides & legs with 2 1/2" screws and glue. 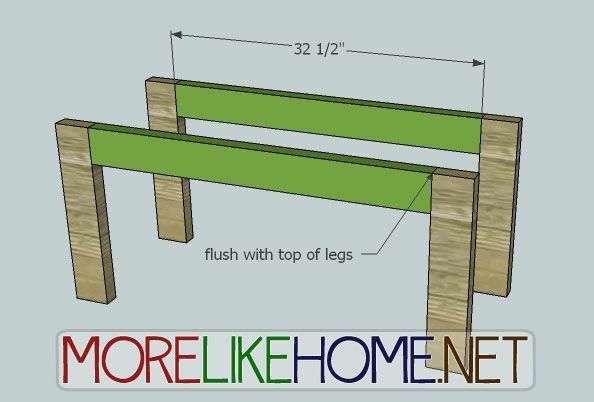 Start by using 6 of the planter front boards (F) to connect two of the planter legs (E). 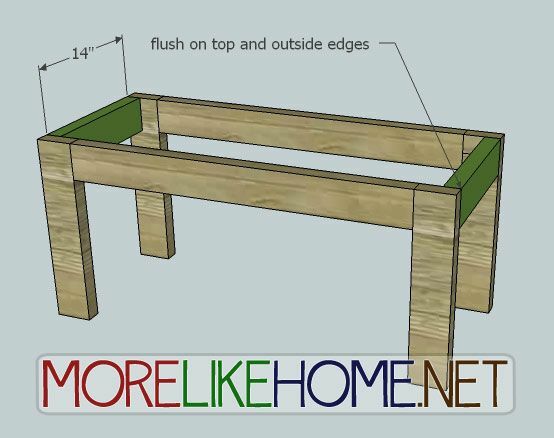 The front boards sit on top of each other and the whole stack should be flush with the top and bottom of the legs. 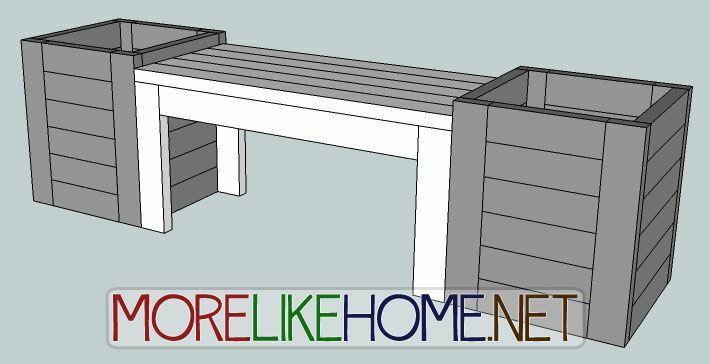 Attach the front boards using a Kreg Jig and pocket screws, or by drilling through the legs and into the front boards with 4" screws and glue. Repeat to build the back section. Now connect the front and back sections using the side boards (G). You will use 6 on each side, again stacked on top of each other and flush with the top and outside edges of the legs. Attach these boards by drilling through the front and back of the legs into the side boards with 2 1/2" screws and glue. Now you can put a bottom in your planter. You probably don't want to actually put it at the bottom of your planter, because you probably don't need that much dirt in there! 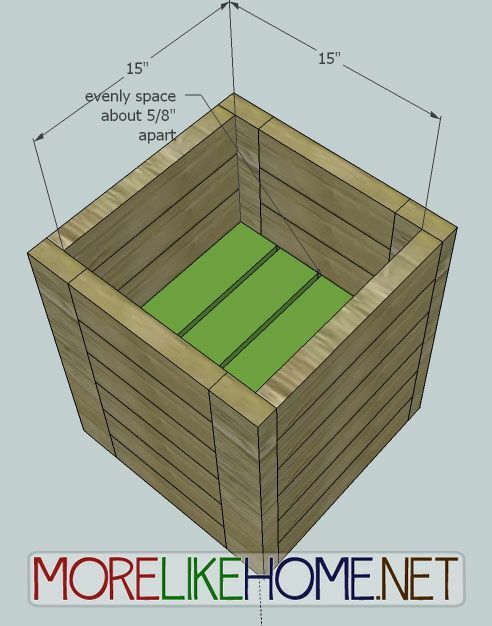 Try installing the bottom boards (H) about 8-12" down from the top of the planter, depending on how much room you think your plants will need. 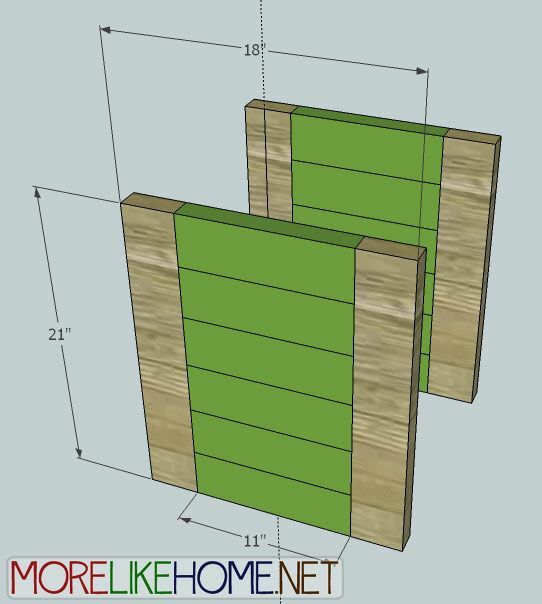 Once you choose your depth, attach your bottom boards by drilling through the front & back sections into the bottom boards with 2 1/2" screws and glue. Your boards should be evenly spaced about 3/8" apart to allow a little space for drainage. Now you can finish your planters. 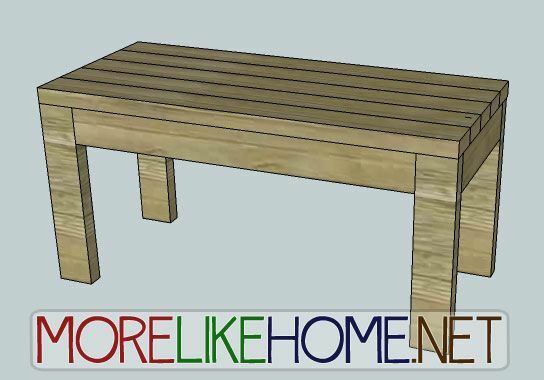 Start by filling any holes sanding everything down, and finishing with paint or stain and polyurethane. Be sure to choose an outdoor product! Did you build both pieces? Then go ahead and put them together however you like! 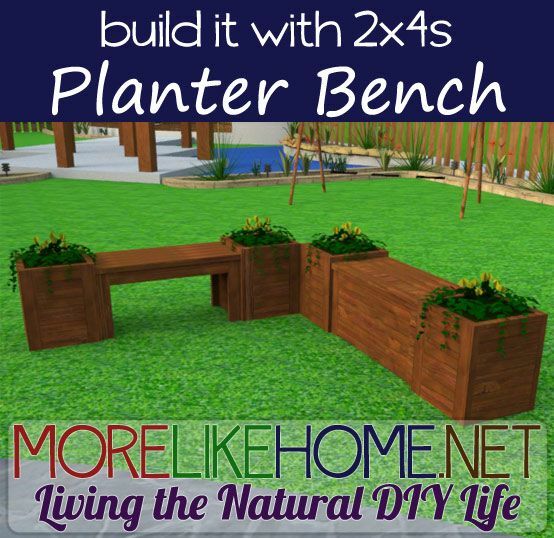 Try a simple bench with a planter on each end, or add another bench and planter to make an L-shaped arrangement for a corner. There are so many possibilities. Get creative with your finishing. Try painting your benches a crisp white and your planters a moody gray or deep navy. Have fun! 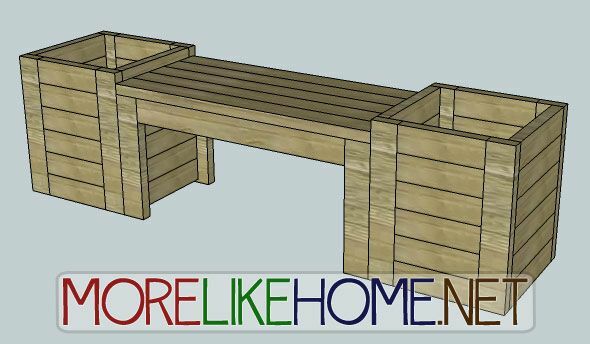 Reader Matt built the bench section for his garden (check it out here). Looks great! Thanks for sharing! No bunnies in these boxes. I like the idea of the planters,but I would be tempted to leave the plants out and put outdoor toys in. What a great spot for a picture! Love it! I love all your projects, but quick question. What program do you use in the first picture to show a the bench in an outdoor setting? Great question...the short answer is SketchUp using Shaderlight (https://www.artvps.com/) for the photo render. It's more complicated than that, and almost all the work was done in SketchUp, but those are the only programs I used before adding the watermark with Photoshop. Maybe I'll do a DIY post on it. Thank you for your hard work on the plans, again! Great project however, a few minor changes would help. 1. 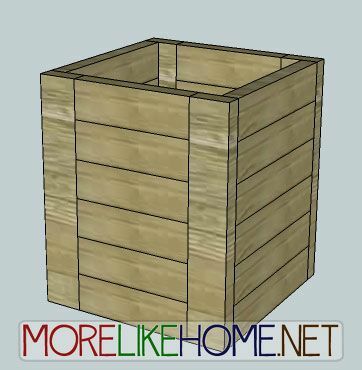 Under the Bench Shopping List, "1 - 2x4 @ 8' long" belongs under the Planter Shopping List. 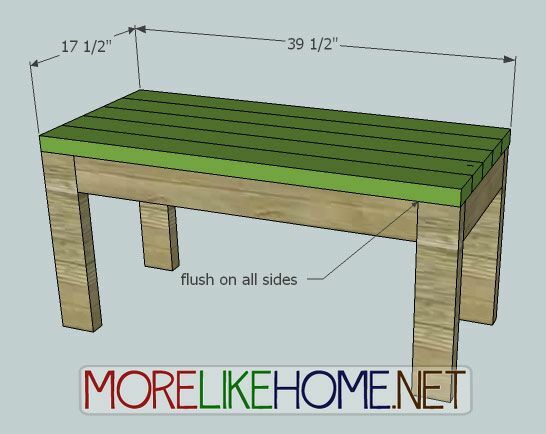 (the total length of 2x4's needed for the bench is 29.875' or, 30'. 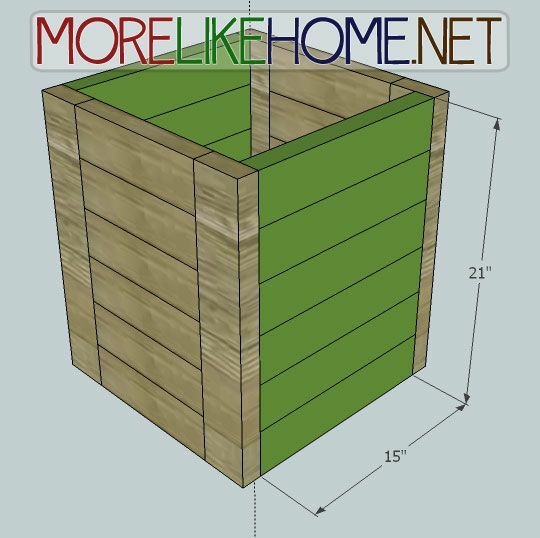 The total length of 2x4's for the planter is exactly 38' which equals three 10' 2x4's and one 8' 2x4). 2. The picture above the shopping list can cause confusion. 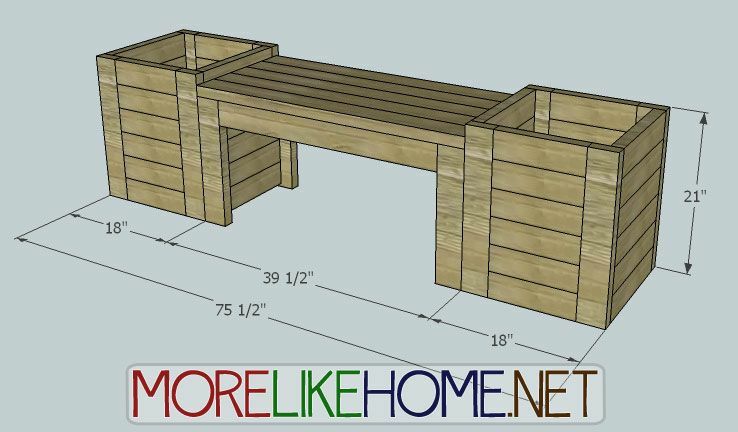 It would appear as if the totals for the two shopping lists would make one bench and TWO planters. I am making both the planters and bench now for my daughter's classroom auction and they are turning out great! Thanks for the plans. 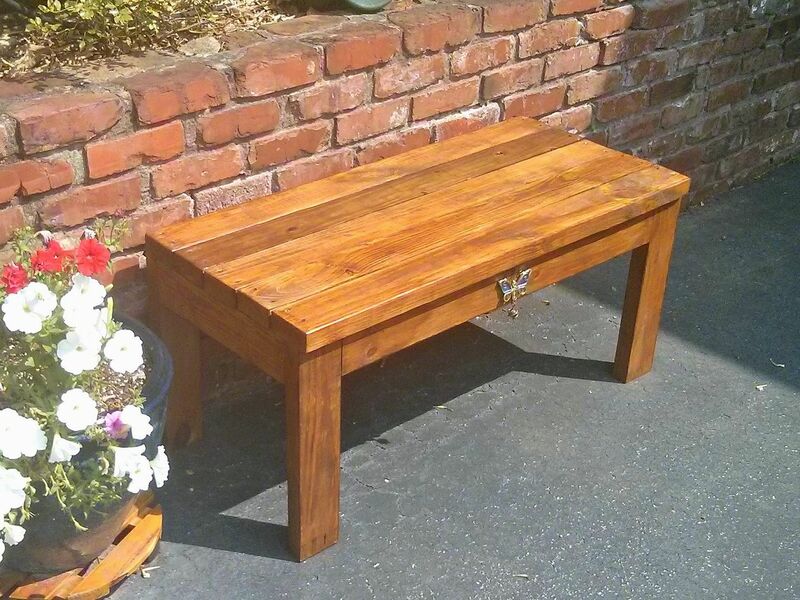 One question: Is the cost total for the planter supposed to be the total cost for the bench and vice versa? The same goes for the planter "total cost."